In the play Macbeth Act II, Scene 2 Macbeth tells his wife that his mind is full of scorpions (O full of scorpions is my mind dear wife). Macbeth is saying that he is unsettled and he cannot enjoy his kingdom because Banquo and his son Fleance are still alive! His thoughts are stinging him like scorpions. Macbeth is confusing ambition with pain and possibly his mental state is starting to deteriorate. But would Shakespeare's audiences have known what a scorpion was? There were no scorpions in England at the time. In 2018 there is currently one small colony in Kent, but in Shakespeare's time England was much colder than now and scorpions would not have survived the winter cold. One advantage of getting up early in the morning in January is that Spica, Jupiter, Mars and Antares form a spectacular, almost straight, line in the morning sky just before sunrise. I took the photo below two days ago. 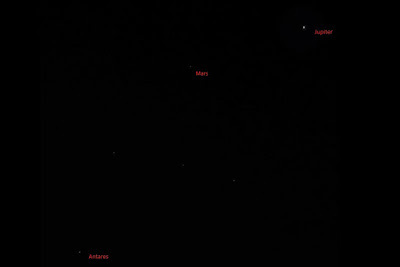 Spica in Virgo was off the camera frame to the upper right but Jupiter, Mars and Antares can be clearly seen. Antares is a giant red star and shines as brightly as Mars. It is sometimes called Anti Mars or Anti Aries and the star and the planet have often been confused in the night sky. Antares is also known as the heart of the Scorpion as it is the brightest star in the constellation of Scorpio. Shakespeare never mentions Scorpio or Antares in his works but Ovid did and he wrote "Now rising you may see with naked eye The brilliant star in Corde Scorpii whose changing colours on a summer's night when culminating. shine so clear and bright and twinkling change with red and silver light". Whilst very few people in Elizabethan London would have seen a live scorpion they would have seen the constellation of Scorpio in the night sky just like Ovid and from this would have had a good idea of what a scorpion looked like. At the Globe theatre in London there may have even been an image of the Zodiac above the stage. There is certainly one on the rebuilt Globe Theatre on London's Bankside.